When I was tiny, I was fascinated by the way my father cleaned squid. I was amazed how that slimy creature with a long body, two beady eyes and eight legs would return from the laundry (which is where he cleaned them) on a plate all clean and white, eyeless and legless. It also fascinated me that although the different types of mollusc looked the same to me on the fishmonger’s shelf, they were made very differently and when I got up the courage to watch papa’ cleaning them, I was amazed by how differently they were made. Growing up right on the Adriatic Sea, squid (calamari) and cuttlefish (seppie) were part of my father’s every day diet. Perhaps because of all these memories, when I started cleaning squid and cuttlefish, I thought it was fun. Really fun. A kind of sense of achievement type of fun. Of course you can buy the whole squid and get the fishmonger to clean it, but surely it is more fun to do it yourself?! Last weekend I bought several medium sized squid to cook that night – I was going to stuff them. If you choose to do the cleaning yourself, the Sydney Fish Market has great YouTube clips that show you how to clean the different varieties. Click here for a demonstration of squid cleaning and here for cuttlefish. Alternatively, just ask the fishmonger to do it for you. Now squid and cuttlefish often get a bad rap for being chewy. 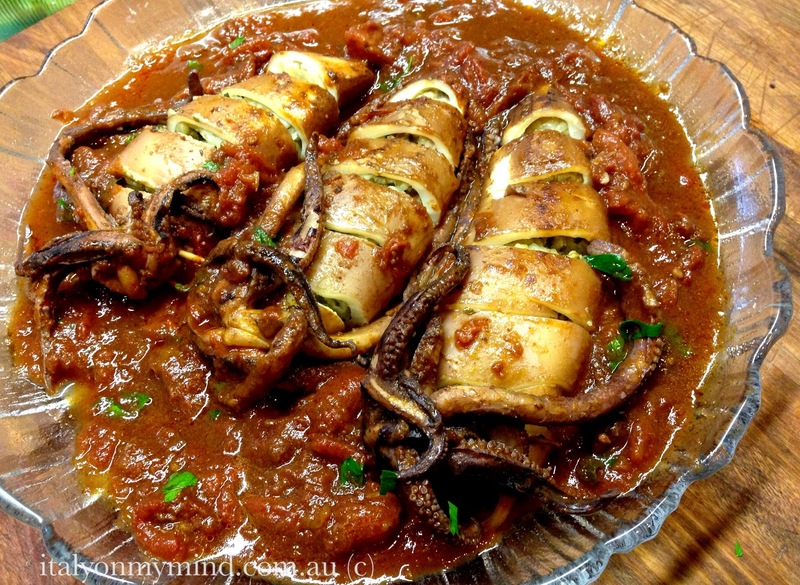 This recipe based on a Guy Grossi recipe from SBS food safari is delicious and results in the most tender and melt in your mouth squid. The secret to tender squid is how long you take to cook them. You either cook them very quickly – a few minutes – or very slowly – at least 40 minutes after braising, if not more. In Guy’s original recipe they were cooked in the oven after braising. It was a hot night when I cooked these calamari farciti, so rather than turn on the oven, I simmered them in the pan for the same time he had recommended. They worked perfectly. The rich tomato and red wine sauce makes this quite a hearty meal, that works well with a salad, or even some soft polenta. And a glass of Sangiovese is essential. Buon appetito! To make the stuffing, heat a splash of olive oil in a small pan and add the onion and garlic. Sauté until onion becomes translucent and add the pancetta and fennel. Cook for a few more minutes and then add the wine and simmer until the mixture becomes dry. Remove from the pan and place in a bowl with the remaining ingredients and mix well. Set aside. Wash the squid under running water and pat dry. Divide the filling evenly between the squid, stuffing in a few tablespoons of filling in each, but making sure they are not overfilled. You should still be able to insert your finger into the tube, almost to the end (the filling expands whilst cooking). Pin the tentacles to the body with a toothpick. Heat some olive oil in a large frypan for which you have a tightly fitting lid. Cook the garlic and anchovies for a minute or two on medium heat and then place the squid carefully in the pan. If you still have the wings, pop them in the pan as well. Sear them on all sides for a few minutes so the flesh takes on some colour then pour in the red wine and tomatoes. Bring to a simmer and then reduce the heat and cover. Cook for 40 – 50 minutes, turning a few times during cooking. Taste the sauce and add salt and pepper to taste. The squid are ready when they are tender when prodded with a fork. Serve on warmed plates. Scatter with fresh parsley. This sounds yummo, and perfect for a winters evening in Florence! I also love cleaning squid, there is something satisfying about the end result. I’m making this for sure, thanks.